I didn't get the flavor i really wanted. Back when i was little, there was an ice cream shop in Montreal that had superman ice cream, which is strawberry, banana and blue moon flavored. Unfortunately, it's pretty much only available online for the west coast, an 70 dollars for 3 gallons of ice cream seems a bit desperate. 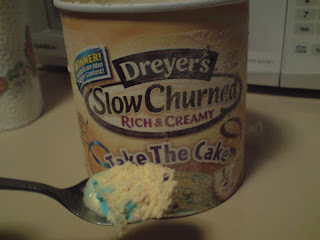 So this is birthday cake ice cream, with frosting swirls and spinkles. It's tasty, but not superman. Do you do the fondue? The evolution of a flash drive. This screams "bad idea" to me. I can smell the power!